This Readers’ Theatre radio-style performance, based on the famous 1938 radio drama that rocked the nation, is just in time for Halloween – one week before its 79th anniversary. 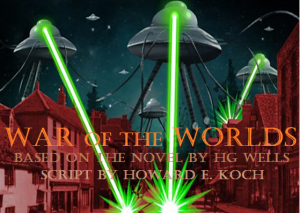 Aired as an episode in The Mercury Theatre On the Air series on the Columbia Broadcasting System radio network, Orson Welles narrated a story of alien invasion and chaos in such a convincing way that it sparked outrage across the country. The play re-tells the story found in H.G. Wells’ novel in the format of news bulletins interrupting the regular programming as if the action was happening in real time.